Despite two unsuccessful title challenges, Stephen Thompson still has his eyes set on the belt, and that quest starts with his fight with Anthony Pettis. Eager to get back in the race for a third crack at the welterweight title, Stephen Thompson was willing to fight anyone and everyone after he rehabbed a torn MCL in his knee following a May 2018 loss to Darren Till. Robbie Lawler. Rafael Dos Anjos. Santiago Ponzinibbio. All killers, all on the hit list of “Wonderboy.” But instead, Thompson got a different, more surprising, offer. Anthony Pettis. Showtime. The guy who jumps off fences. And yes, we’re as excited as Thompson is. But will Saturday’s main event in Nashville live up to all our expectations? On paper, this is a matchup of two of the premier strikers in the sport, and ones who have no shortage of clips on their highlight reels. But this is a mixed martial arts bout, so while both combatants say they expect a standup battle, so many similar matchups have often turned into a wrestling match. So will Thompson or Pettis blink and start looking for takedowns? Pettis has gone on the record saying that he won’t be. But Thompson is ready for that possibility. 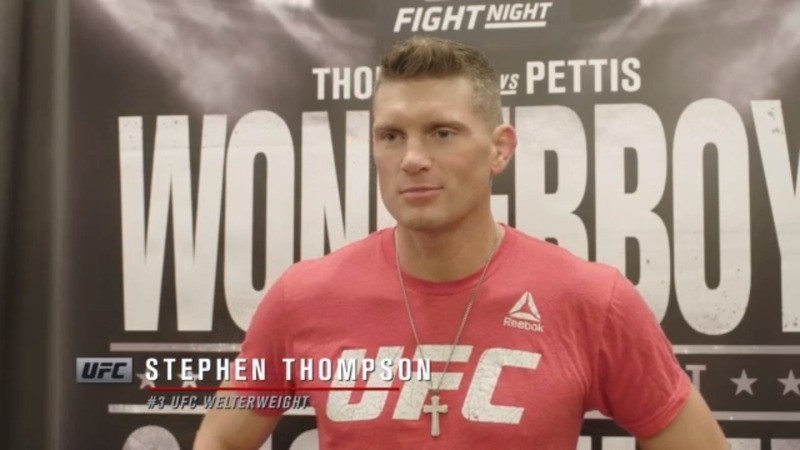 Watch Stephen Thompson talk to the media about his upcoming main event fight at UFC Nashville. That could be an annoying, but understandable, byproduct of being an elite striker, or it could be a compliment. Thompson, one of the nicest guys in all of sports, always sees the glass as half-full. Call me crazy, but I think we’re going to get what we want Saturday night. That would be music to the ears of Thompson, who now has a clearer path to another world title shot since the man he fought twice for the belt – Tyron Woodley – has been dethroned by Kamaru Usman. And the belt remains his primary focus.